WORLD WIDE WEB AWARD: On March 29, 2005, Leeside Farm Photography became a proud winner of the Silver World Wide Web Award 2005. 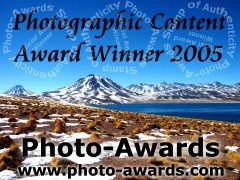 In February 2005, Leeside Farm Photography became a proud winner of the Photo-Awards Photographic Content Award. Click here to open an email to leave a comment in our Visitor's book. Russ Gilsdorf: Congratulations on a most unusual and visually stunning website. What wonderful photographic images . . . nature, animals, city scapes and architecture and all done with a painterly aesthetic. I am amazed that you make very difficult and atmospheric images look so easy and uncomplicated. Joe & Alma Estrada: Splendid work! We are grateful to our friend Cathy Fontechia for directing us to your website. We love all your work ..... it's splendid! And somehow, we get the impression the young bull is your personal favorite! Marie Jean Benis: Your website is gorgeous -- congratulations on your work and your shows. Cathy Fontechia: Your art work is remarkable. What a talented person you are. There is so much feeling in your renderings; color , lighting, design, subjects, and everything in your representation of each object, overwhelming. Keep up the great work. Linda Noren Adams: I like your new pictures...very nice. You also reorganized the group, which I think makes sense. Carly Erdman: The photos are amazing. I had never seen the Washington DC ones before. One is more magnificent than the next. Farm Animals, Wildlife, and Bucks County Landscapes. Image subjects: chicken, rooster, hen, cow, bull, cattle, silkie, guinea, deer, mushrooms, Florence, South Beach, Miami, Florence, Myanmar, Windermere, Isleworth. Carol Carmichael, photographer.